This article is for informational purposes only and does not constitute medical or legal advice. While the cultivation, possession, distribution, and use of marijuana for medicinal or recreational purposes may be legal in certain areas, marijuana is illegal under U.S. federal law and in certain states and countries. Readers should consult the local and federal laws in their jurisdiction and qualified medical and legal professionals. Marijuana use can be harmful to certain individuals, including minors and women who are pregnant or breastfeeding. Cannabis was grown as any other kitchen garden plant when Humboldt farmers first started to cultivate it as part of the back-to-the-land movement of the ‘70s. 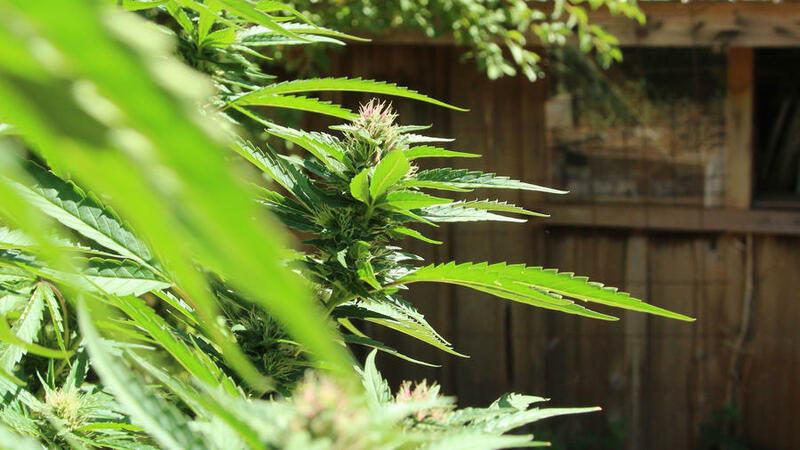 California’s progression toward legalization over the last decade has made it easier for cannabis farmers to share their knowledge with you today. Davies is a second-generation cannabis farmer, currently based in Humboldt County. He’s a co-founder of Humboldt Legends, a benefit corporation of about 30 farms in Humboldt County who have pioneered organic methods for growing cannabis outdoors. Below, Davies shares his best practices for incorporating cannabis plants in your garden. Find out your local laws governing growing at home. There could be regulations down to the block you live on. Local ordinances may ban cultivation outdoors. Currently, California and Colorado residents can grow up to six plants per household whether for recreational or medicinal use. Each plant can yield one to ten pounds of flower and trim. The plant can grow up to 15 feet tall depending on the strain and the maintenance of the plant. It’s better not to start the plant’s life at the beginning of the year. Most of the farms working with Humboldt Legends plant in March and harvest by mid-October. Research each strain to understand its unique growing needs as well as how to yield its greatest potential and understand its effects. Indica, sativa, hybrids, and strong-CBD strains have different growing considerations depending on climate, elevation, and other natural factors. Choosing whether to plant seeds or clones is a big decision for the course of your plant’s life. Seeds can be shipped to you, are discreet, and are easy to store. Your emerging plant comes pesticide- and microbe-free. You can also hybridize seeds to create new cross-strains to tailor the plant’s effects on you. One drawback of seeds is that you won’t know the plant’s gender until its pistils come out; to stack the deck in your favor, seek out feminized seeds. If you do wind up with male or hermaphrodite plants, you can compost them and put them back into the soil eventually. Clones are usually taken from adult female plants, so you know exactly what you’re getting. They’re relatively easy to procure; as of now, can be purchased commercially with a medical marijuana card. However, if your clone comes with mildew or mites, it won’t be immediately obvious. Even in its early stages, mildew presents itself with telltale white fuzz growing on the fan leaves. Mites come in a variety of species (spider, broad, etc.) and they are harder to spot than mildew. More readily noticeable are the signs of damage they wreak: yellowing or spotted leaves or drooping, lackluster structure. In more advanced stages, spider mites will leave webs all over the flowers. Plant in full sun at the north edge of your garden. Chose a spot with well-drained soil. Make sure the plant has plenty of room to grow as plants can grow an inch to an inch-and-a-half a day. All of the plant’s energy goes into growing bigger. Start fertilizing at the vegetative stage of the plant (i.e. when stems and leaves are growing, but before the plant begins to flower) with nitrogen-rich fertilizer, which enables stems to be strong enough to hold the weight of heavy buds. Switch to phosphorous-heavy fertilizer when the plant starts flowering, usually six to eight weeks into the growth of your plant. You’ll know it’s a flowering female by the appearance of pistils, small hairs that turn to denser nodes. The colors of the pistils change from white to red, green, and purple. Pistils don’t tell you anything about the potency or taste of the future flower, but they add a nice ornamental element to your garden. A warning about the use of pesticides, fungicides or harmful chemicals: Whatever you feed the cannabis plant, you wind up ingesting once the plant is harvested. Refrain from using any harmful chemicals that would be toxic upon igniting or baking. The flower can get so heavy that when it rains, its branches break. Two to three weeks in, stake with 4-foot bamboo stalk (you can start with a strong center stake, but it isn’t imperative). Once the plant is much bigger, keep the stakes in place to maintain central support. You can also use trellis netting attached to a central stake to keep flowers up. Botritis (bud rot) is especially worrisome as it destroys flowers from the inside out, leaving a rotten area that turns brown or gray and mushy. Good air circulation, arid conditions, and regular spraying with an organic fungicide will prevent or limit the damage. Other pests such as cucumber beetles will nibble on the fan leaves but leave the flowers alone. Calling a truce with these tolerable pests tends to be easier than fighting them off. If your buds are blooming then the plant’s interior area is shaded, reducing the plant’s much-needed exposure to the sun. When your plant starts to flower, be aggressive in pruning the big yellow and brown fan leaves to reduce the chemical intervention of pesticides, fungicides, or other chemicals later on and to reduce pressure from powdery mildew and any kinds of molds. Start cutting in mid-October. More than half of the pistils should have turned colors by now, which signals when the buds are ready be harvested. On average, the home gardener can yield two to five harvests from each plant. Hang your cuts in a dry, warm place with good air circulation for five to seven days. It need not be totally dark, but minimizing direct sunlight is important as it will degrade the plant’s effects more readily and fade or bleach the color of the flowers. You can use a dehumidifier on flowers that have a little bit of moisture to them. Stems should snap and not bend. Trim leaves, but not too close to the bud. Davies recommends separating big and small buds. The smalls buds’ trim and stems can be used to create tinctures, concentrates, and edibles.